We are a small school, with loads of experience. We are honest, friendly & patient. 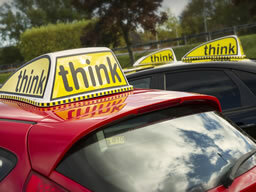 We can take you on your journey from a novice learner to an experienced and well prepared driver and full licence holder. We can also provide the Pass Plus service, which teaches you the things we can't teach you while you are a learner. Think was set up by Ian Weir and Doug Edwards, both very experienced instructors, who started their career in 2005 at the age of 22. They have a real passion for driving and enjoy passing on the joy of driving to the people they teach, whether it be a learner or one of their trainee instructors. Both Ian and Doug have experience teaching both. This helps us keep our teaching skills up to the very latest standards. "We started think to develop a school that prepares people not only for the driving test, but also to be safe drivers after the test to.